That's awesome! 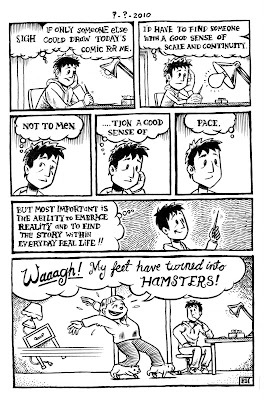 Hamster-feet?! It's brilliant! I'll have to check out Ben's other stuff... thanks, Chris. I LOVE my hamster feet! So cool, Ben! I love how he got your lettering down perfectly as well. Looks like a great comic but hard to read on the small view... Could you please link to a larger version? Much better, I love being able to see the detail, thanks!